The mountainous state of Colorado is home to a lot of towns that are perfect for anybody looking for an escape into nature. With some of the largest and most popular ski resorts in the US, Colorado is a skier’s haven, but plentiful parklands, hilly terrain, majestic rivers, and primeval forests make it a hiker’s paradise too. 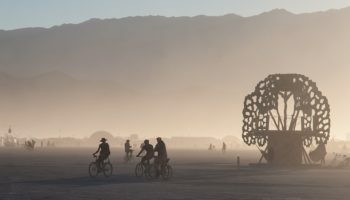 Combine it with a history of silver mining, and a present-day status as one of the most progressive, liberal Western states, and you have a fascinating place to explore in terms of nature and culture. Founded as a “scenic health resort” thanks to its natural mineral springs in 1872, Manitou Springs boasts a whole lot of historic buildings that point back to its origins as a resort. There’s the entire Manitou Springs Historic District to wander around, complete with old residences and hotels. 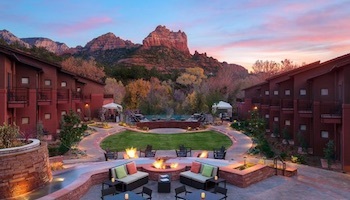 Sometimes referred to as the “Saratoga of the West”, this resort town is also located near the stunning, alien landscape of The Garden of the Gods with its red rock spires and scrublands. Ziplining, caving, and ropes courses are up for grabs at the nearby Cave of the Winds Mountain Park too. Thanks to its stunning alpine environment, Ouray is often called the “Switzerland of America”. As such, you can get involved in ice climbing at Ouray Ice Park – attracting adventurous types from across the globe – and go hiking in the scenic Box Canyon Falls Park. Prospectors arrived in Ouray in 1875, looking to get rich from the multiple silver and gold mines in the area; the wealth from the mines is reflected in the historic buildings here, like the brick-built Beaumont Hotel and the Ouray City Hall. Film fans will appreciate that some scenes in the original True Grit (1968) were filmed in and around Ouray. If you like a spot of skiing, Frisco is the town for you. There are no less than four ski resorts located nearby: Arapahoe Basin, Breckenridge, Copper Mountain, and Keystone. You can also go cross-country skiing at the Frisco Nordic Center too. For those less interested in skiing, the Frisco Adventure Park is perfect for biking and hiking in the summer months. 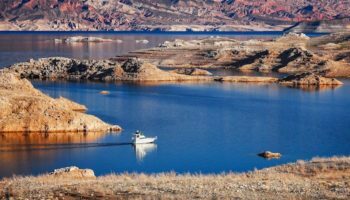 The nearby Dillon Reservoir is perfect any time of year: winter means ice fishing and snowmobiling, whilst summer brings the promise of yachting and rainbow trout fishing. Needless to say, Frisco is perfect for outdoor enthusiasts. Trinidad was settled in before Colorado even became a state in 1876. The 1860s brought Spanish and Mexican settlers, who liked the convenient location close to the historic trading route, the Santa Fe Trail. The infamous Drop City, located north of Trinidad, was the first rural hippie commune, established in 1965, before it was abandoned in the 1970s. Today Trinidad has been dubbed “Weed Town, USA”, owing to its 23 marijuana dispensaries – that works out at one for every 352 people! Aside from cannabis and counterculture, there’s plenty of history to soak up in Trinidad: the Trinidad History Museum is a good place to start. 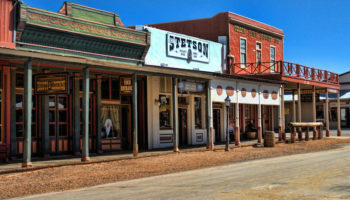 Named after the first known English explorer of the area, John W. Gunnison, this small town began to grow in the 1870s; you can learn all about the history and heritage of this place at Gunnison Pioneer Museum. But if you’re more interested in soaking up some local Western culture, make sure you’re in town for Cattlemen’s Days. This 119-year-old festival celebrates the Western way of life, complete with rodeos and a parade. Visiting in the winter months? Then you will get to have some fun skiing at the Crested Butte Mountain Resort or the Monarch Ski Area. The county seat and most populous town of Garfield county, West Colorado, Glenwood Springs is – true to its name – another of Colorado’s mineral spring towns. But you won’t just be soaking up the restorative water at the hot springs here. 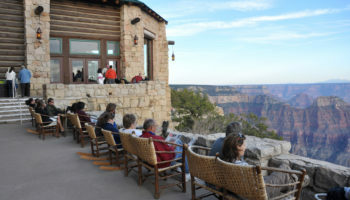 There’s a ton of activities on offer from skiing at the Sunlight Mountain Resort and hiking the picturesque boardwalk of Hanging Lake, to paragliding, rafting, and fishing. In 2015 it was named “Most Vibrant Small Town Arts Environment in the United States” – and Glenwood Springs’ Downtown area is the place to be for culture, food, and drink! The old silver mining town of Silverton sits in a valley in the San Juan Mountains. The town has left its mining days behind and grown to become a popular ski resort luring visitors there with its rustic, remote charm. Located at a lofty 9,000 feet above sea level, Silverton’s sloping mountain sides are snow covered during the winter and ideal for expert skiers as well as beginners. The slopes become sun-soaked meadows in the summer months and are lace with hiking trails which make their way past gushing waterfalls. 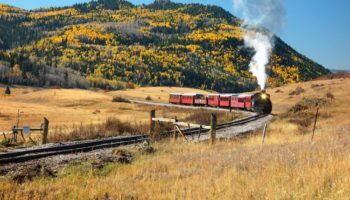 Durango & Silverton Narrow Gauge Railroad offers the chance for tourists to hop aboard a steam trail and journey back in time to the town’s mining past. Another of Colorado’s glorious mining towns, Crested Butte used to mine coal and silver before the industry started to decline. Nowadays the town is a booming destination for outdoor enthusiasts who enjoy adventuring among the stunning beauty of the East River Valley. Skiing and snowboarding are what the town is most famous for, but in warmer months rock climbing, hiking, kayaking, and fishing are also extremely popular. Not only that, but the town claims to have been the spot where mountain biking was invented. Whether or not that is true remains to be seen, but it is a fact that Crested Butte is still a fantastic spot for fans of mountain biking. 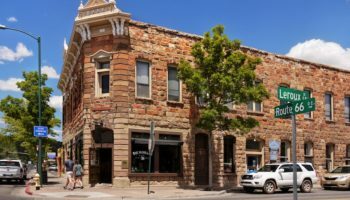 Durango’s Main Avenue is the prettiest historic area in town, with buildings like the Strater Hotel and The General Palmer Hotel providing a backdrop of iconic heritage. At one end of Main Avenue you’ll find the depot for Durango & Silverton Narrow Gauge Railroad – the same old-timey railway you can actually ride all the way to Silverton, through the slopes and valleys of old prospector country. 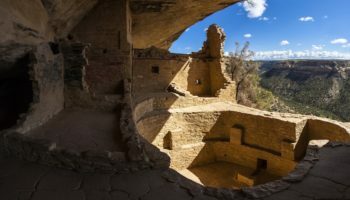 Durango is also the gateway for the incredible Mesa Verde National Park, home to cliff-side stone palaces and pueblos built by indigenous people to the area over 1,500 years ago. The small town of Creede packs a punch when it comes to history. Born out of the silver boom in the late 1980s, Creede’s popularity grew incredibly from 600, in 1889, to well over 10,000 in 1891. This influx of people looking to make their millions from silver left once the boom ended and nowadays Creede’s tiny population is less than 300. The high elevation in the mountains and the authentic late 19th century buildings make this not only a picturesque place to visit, but also a fantastic spot to for filmmakers. 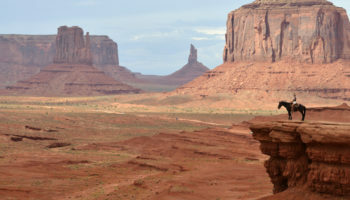 Numerous films and television programs have been shot in and around Creed, including the 1976 John Wayne film The Shootist as well as the 2013 film, The Lone Ranger. 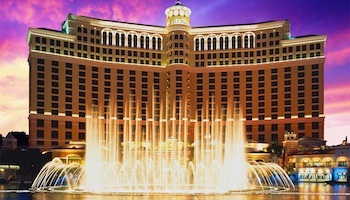 Without doubt, the main attraction of Vail is the Vail Ski Resort – Colorado’s largest ski mountain. So, if you’re here for the skiing, you are in for a treat, with all the skiing and snowboarding you could dream of in very easy reach of the town. Twinned with the quite literally stunning alpine scenery, with glassy lakes, pine forests, and snow-capped mountains to take in, is the charming look of the town itself. 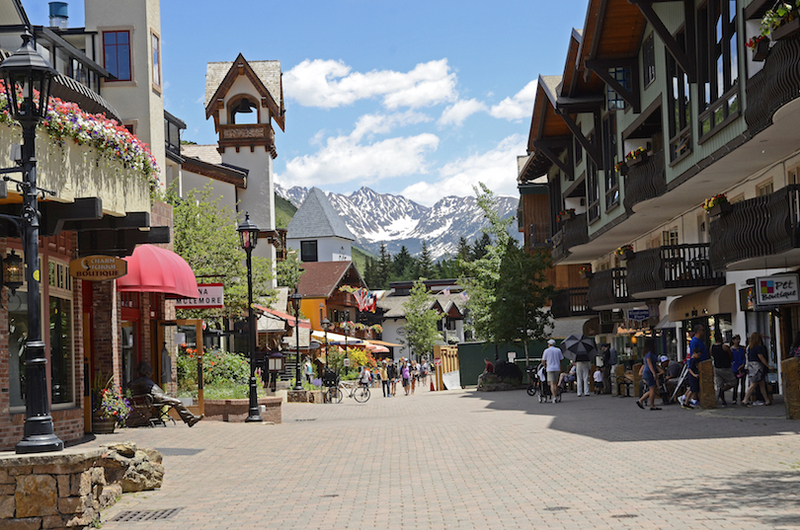 Head to Vail Village for a quaint, old world feel, or get lost in the winding lanes and colorful, European style buildings of the Lionshead district. Known for being the central command for the Rocky Mountain National Park, Estes Parks is the place to come for anything outdoor related. 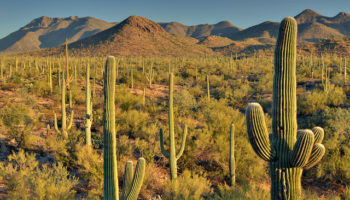 Skiing in the winter, hiking in the summer, and a whole lot of activities in between, you won’t be stuck for things to do if getting out into nature is what you’re here for. Notably, Estes Parks is also known as the home of The Stanley Hotel; dating back to 1909, this is the hotel that inspired Stephen King’s, The Shining. Naturally, tours of this Edwardian hotel are King-based. Vail Ski Resort may be the state’s largest ski mountain, but Breckenridge Ski Resort is Colorado’s most popular; this ski resort is one of the most visited in the Western Hemisphere. Though skiing is most likely the reason every visitor comes to Breckenridge, the origins of this town lie in mining. And remnants of that prospector-born wealth are reflected in the log and clapboard fronted buildings dotted throughout town, dating all the way back to the late 19th century. The hiking is perfect around here, too; head to Blue River for wildflowers along the scenic trails in summer. Another Rocky Mountain town with good skiing credentials, Steamboat Springs is home to not just one, but two good skiing areas. 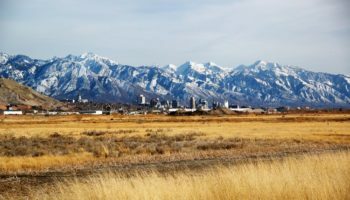 There’s the popular Steamboat Ski Resort, situated on Mount Werner just out of town, as well as the much smaller Howelsen Hill Ski Area – named after the man who brought ski-jumping to Steamboat Springs in 1913. For more water-based fun, you can go for a spot of white-water kayaking on the rugged Yampa River. And if you’re a keen cyclist you’re in luck: in 2011 the League of American Bicyclists officially approved the area around Steamboat Springs as a prime spot for cycling. With its history rooted in the late 19th century mining boom in the area, Telluride is awash with historic buildings. In fact, these make up a significant portion of what constitutes the town, arguably making it the best place to come if you feel like hopping back in time to the mining days themselves. 80 acres in the Downtown area of the former silver mining camp are perfect for exploring, now filled with restaurants and boutiques. Telluride is also a great jumping off point for skiing – being just a gondola ride away – and hiking, or driving, to Bridal Veil Falls is a great way to soak up the unreal landscapes around this beautiful town.